Alongside all the new Echo devices Amazon announced on Wednesday, the company also revealed a subtle but significant shift in its smart-home strategy. Alexa is no longer just a layer of voice controls that supplements other smart home systems such as Samsung SmartThings, Alphabet’s Nest, Philips Hue, and Lowe’s Iris. Instead, it’s becoming a full-blown smart-home platform, replacing many of the functions that those other systems provide. The implication is that Amazon doesn’t want to play a supporting role in smart homes anymore. Instead, it wants a hand in every interaction, even if voice isn’t always involved. The most notable change is support for routines that trigger several actions at once. This allows a user to say “Alexa, goodnight,” and have the system lock the doors, turn off the lights, and lower the thermostat. Alexa will also provide more feedback on device state, so users can check on the thermostat temperature or ask if any lights are on. Meanwhile, the Alexa app will serve as a central dashboard, where users can monitor and control their devices. These are not new concepts for smart-home systems, and they’re not even new to Alexa. Samsung’s SmartThings platform, for instance, already supports multi-device routines that users can trigger through Alexa voice commands, as does Wink. But that’s the point: Instead of leaning on those companies for home automation, Amazon now wants to handle the automation itself. Still, Amazon can’t fully replace other smart-home hubs without offering one of its own. To that end, the company announced a new connected speaker called the Echo Plus. It has the same design as the original Echo, but adds a ZigBee radio inside. Amazon’s fellow tech titans have been reluctant to take this step. Apple has avoided building a HomeKit hub, content to let users deal with third-party bridges instead. 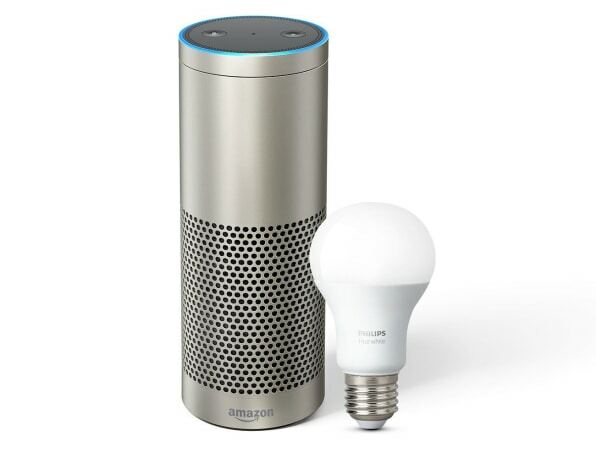 And while Google’s OnHub and Wi-Fi routers both include ZigBee radios, they can only control Philips Hue bulbs through a smartphone app. Google hasn’t used those radios to build a broader smart-home hub. Some smart-home vendors might argue that their own hubs and bridges are still necessary. For instance, George Yianni, Philips Lighting’s head of technology for home systems, told me in a previous interview that the Hue Bridge has tighter integration with the company’s light bulbs compared to third-party bridges. He reiterated that point in an email this week. But Amazon may have an answer to this as well, buried within the strangest announcement from its Wednesday press event: Later this year, Amazon will launch a new category of “Alexa Gadgets” that can send and receive commands from devices like the Echo. The first of these gadgets will be a smart button that lights up and serves as a buzzer for trivia games. For now, Amazon is pitching Alexa Gadgets as a fun diversion. Still, the underlying tools include the ability to move motors, react to Alexa notifications, synchronize with sounds or music, and send commands back to Alexa. In theory, these capabilities could power a wave of new smart-home triggers such as light switches, door locks, and motion sensors–all with deep ties to Alexa. This in turn could fill in the one missing piece in Amazon’s smart-home platform, which is the ability to have one device prompt an action on another. All of this should put Amazon on a level playing field with Apple, whose HomeKit framework already includes both the voice interaction layer (through Siri) and the underlying routines and triggers (through the Home app). The new strategy also turns Samsung’s SmartThings and Alphabet’s Nest into more direct competitors, even as they support Alexa voice commands on their own platforms. In other words, Alexa is no longer just a benign voice assistant that plays nicely with other smart-home platforms. With millions of Echos in living rooms, kitchens, and bedrooms, and a year-and-a-half of accrued knowledge about how smart-home devices should work, Amazon’s going to war.